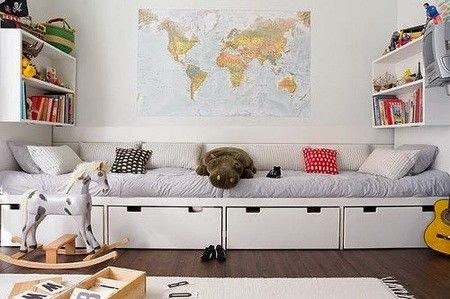 If I were a little kid, I wouldn't mind sharing this adorable room! I like how the "white" color scheme keeps things looking clean and uncluttered. I especially love the abundant storage compartments that were implemented within the limited square footage. There's room to store books, toys, extra bed linens, etc. Everything also remains easily accessible to a child. This space would also work great for one child. The set-up allows plenty of space to have a friend over for a sleepover! Have a wonderful weekend celebrating the fathers in your lives! A special "Happy Father's Day" greeting to my hubby!! !